As the famed troubadour Ignacio Carrillo (Marciano Martinez) informs the aspiring musician hopeful Fermin (Yull Nunez), mastery of the accordion cannot be taught; it's an ability or gift that one either possesses or they don't. And although obviously Ignacio has the talent, he's also conflicted over his unique black, horned instrument as well which was given to him by his master and rumored to have once belonged to the devil himself. Yet despite the fact that Ignacio is unwilling to pass along his tuneful knowledge to the teenager who made the impulsive decision near the start of Ciro Guerra's film to accompany him on a seemingly endless walk to reunite the accordion with its rightful troubadour owner, Fermin remains as determined as ever to stick by the former wandering nomadic countryside musician. Having given up the accordion once he wed, only to find that the devil came to claim his wife shortly thereafter, the bitter Ignacio grudgingly discovers he must take up the instrument once again to help make enough money for their journey, which opens up some old wounds as the viewer ascertains that the men's quest is not just about the present but their past and future as well. The official submission to the Best Foreign Language Film category of the Academy Awards from its native Colombia, Ciro Guerra's meandering movie which garnered Rome's Un Certain Regard Award at the Cannes Film Festival echoes other Latin American road movies released by Film Movement in addition to the glossier works by Walter Salles. Yet due to its achingly beautiful near David Lean style panoramic cinematography from lensman Paulo Andrews Perez, The Wind Journeys also manages to affect the viewer on a haunting, mythical level as though Guerra was channeling Wim Wenders' masterful nomadic effort Paris, Texas, all the while ensuring that instead of the American Southwest, what we were experiencing was genuinely Colombian with tributes to Caribbean storytelling and Vallenato musical culture. Intriguingly in taking what could've been a very straightforward set-up of a mentor/student relationship and adding levels of mysticism to the melancholic approach of unraveling narrative wherein secrets, regret and promises old and new come spilling out, Ciro Guerra has crafted something that demands that audiences fully engage with the work which feels both steeped in realism and magic. Overall it's an audacious effort that broke new cinematic ground from a technological standpoint in Colombia for a film which is even more impressive when you realize that the world-weary story being woven was written and directed by a man under the age of thirty years old in only his second cinematic effort to date. Admittedly The Wind Journeys may test viewer patience at times with its deliberate pacing that makes 117 minutes feel much longer as the journey continues on and Fermin's shoe leather begins to fall apart. 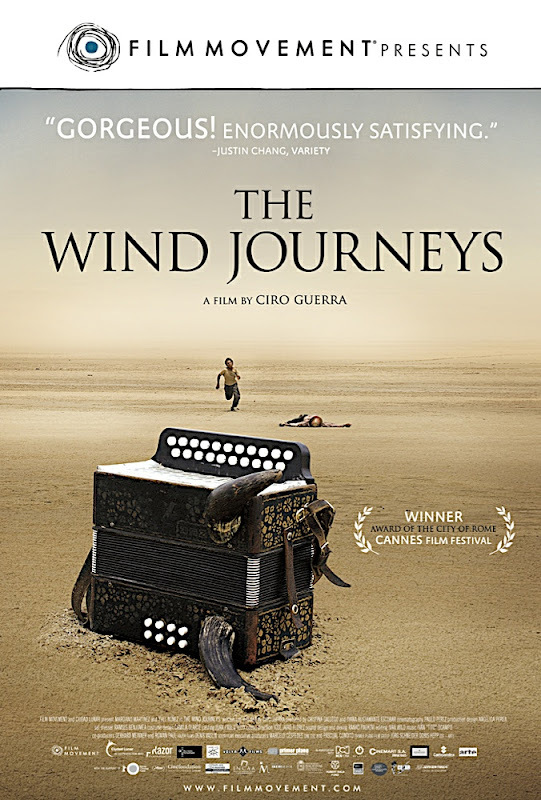 But given the hauntingly rhythmic beauty in the images and the music that comes pouring out of the speakers, it's a quest well-worth embarking upon especially when you consider that much like accordionists, filmmaking at its purest form is something that one either has or doesn't have and that Guerra's talent is rhapsodic right from the start. Text ©2010, Film Intuition, LLC; All Rights Reserved. http://www.filmintuition.com Unauthorized Reproduction or Publication Elsewhere is Strictly Prohibited and in violation of the Digital Millennium Copyright Act.